In this excerpt form his new book Cracking the Carbon Code: The Key to Sustainable Profits in the New Economy, author Terry Tamminen examines the state of carbon management and the companies that are taking advantage of this shift to a green economy or those being burned. reduce carbon emissions 10 or 20 percent over the next decade. the policy goals will be achieved. carbon markets have already gone global and will soon be linked. market value of the previous year. be more true in terms of managing carbon. and losers in the race to reduce carbon footprints. cut emissions from that source by a third in one year. or seek to hedge with derivatives. these markets trustworthy, will do very well in coming years. only once for compliance with regulatory schemes). many cost-effective strategies to deal with such a large shoe size. when the carbon footprint is so enormous). such as increased storms, droughts, floods, and sea-level rise. of low impact vulnerability and high source vulnerability. investors and managers on the planet–but you’re not done yet. 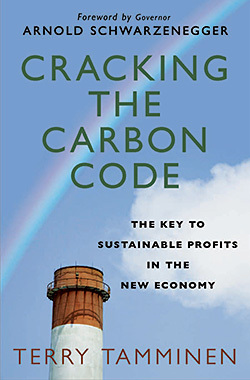 Excerpted from Cracking the Carbon Code: The Key to Sustainable Profits in the New Economy by Terry Tamminen. Copyright © 2010 by the author and reprinted by permission of Palgrave Macmillan, a division of Macmillan Publishers Limited.